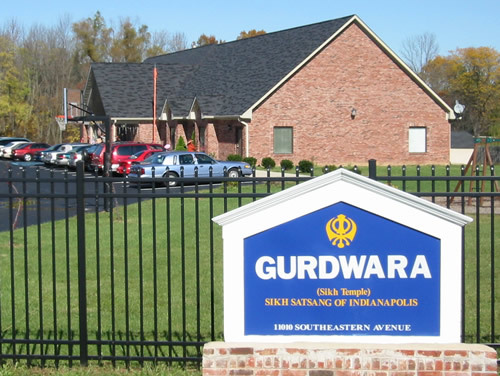 Built in 1999, the Gurdwara is home base for many Sikhs who call Central Indiana home. Though small in number here, Sikhs make up the fifth-largest religion in the world. If you want to enter the Gurdwara, custom demands that you take off your shoes and cover your head with a scarf or turban. During a recent service inside the diwan hall, musicians played the harmonium, tablas and other percussion instruments, giving voice to the hymns in the Sikh scriptures. There are 5,867 hymns enshrined in the scriptures, including nearly 900 from Muslim and Hindu saints of various castesParticipants walk to the raised canopied platform, on which the sacred scriptures are placed under brocaded silks. There they pray and make an offering. Later in this service, Giani Pritam Singh, the Granthi or head priest of the Sikh Satsang of Indianapolis, reads from the scriptures and then leads the group in prayer. At the end of the service, a whole-wheat flour pudding is given to the participants in a "sacrament/blessed offering." Holy words: Giani Pritam Singh, the Granthi or head priest of the Sikh Satsang of Indianapolis, read from the Sikh scripture, the Guru Granth Sahib, during Sunday services at the Gurdwara Sahib of Indianapolis near Acton in southeast Marion County.